Over the weekend I did a lot of baking and cooking. We had Homecoming at church and I always try to prepare a lot of delicious food to share with my church family and guests as well. We want to make sure everyone has plenty to eat and enjoys their time together as we have a meal and fellowship after our worship service. But on Saturday afternoon, I had to take a break from cooking for the church and turn my attention towards another project. My Dad is turning 60 this year and they were having a surprise birthday party for him. I couldn't think of anything he might like better than a black walnut cake. His Aunt Lucille used to make them for family reunions and he loved them. I don't have her recipe, but I tried my best to come close. After having a piece, my Dad said that this recipe was better than hers. My Aunt Lucille was a precious lady and a wonderful cook... so I take that as a very high compliment! In a large mixing bowl, cream butter and shortening; gradually add sugar, beating well with an electric mixer at medium speed. Add egg yolks, one at a time, beating well after each addition. In another bowl, combine buttermilk and soda; stir until soda is dissolved. Add flour to creamed mixture alternately with buttermilk mixture, beginning and ending with flour. Stir in vanilla and black walnut extract. Add in 1 cup black walnuts; stir well. In another bowl, beat egg whites (at room temperature) and cream of tartar until stiff peaks form; fold egg white mixture into batter. Pour batter into 3 greased/floured 9-inch round cake pans. Bake in a 350° oven for 22-25 minutes or until pick comes out clean. Cool cakes in pans 10 minutes; remove from pans and let cool completely on wire racks. Spread Cream Cheese Frosting between layers and on top and sides of cake. 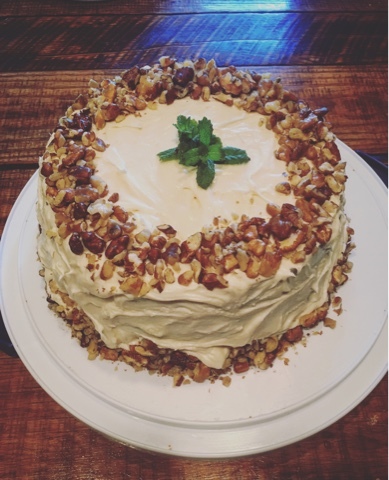 Press additional chopped walnuts onto sides of cake.